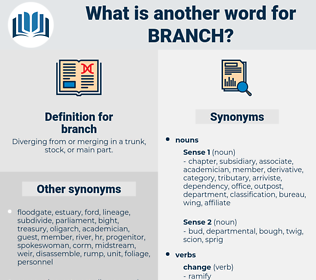 What is another word for branch? Diverging from or merging in a trunk, stock, or main part. BRAS, techniques, parliamentarians, inspectors, combatants, participants, contracts, Conferences, governors, Measures, Resources, Inquiries, exhibits, applications, Veterans, objectives, fighters, targets, Surveys, offerings, points, ESS, Trustees, claims, CES, Goals, requests, directorategeneral, department, departments, subdirectorate, direction, directions. administrations, Secretaries, Hierarchies, principals, managements, currents, managers, producers, heads, owners, Gestures, rulers, imports, auspices, Prices, types, directorates, governors, Resources, directions. annexes, Dies, ramification, Antennae, department, limb, direction. Chaired, empowered, headed, Issued, Worked, Served, Aimed, conducted, held, Provided, led. directorates, directorate-general, section, sections, bureau, Bureaus, Bureaux, divisions. directorate-general, section, sections, bureau, Bureaus, Bureaux. The 1917 Report of the Chicago Branch of the National League on Urban Conditions among Negroes.
" We must get some flowers for the table," said Aunt Polly, after she had helped Linda put the boxes in a low branch of a tree where nothing could touch them. judicial branch, legislative branch, executive branch, Executive Office of the President, local post office, post office. billabong, confluent, affluent, tributary, distributary, feeder. limb, sprig, branchlet, Deadwood, tree branch, twig.